At the ASCE Board of Direction meeting in Traverse City, Michigan, July 12-13, the board approved a fiscal 2014 operating budget that provides funding for the Society’s 3 strategic initiatives – sustainability, infrastructure, and Raise the Bar; restores funding for a second ExCEEd training workshop that trains college-level teachers; and restores funding for SPAG (State Public Affairs Grants) to support public affairs activities by ASCE Sections and Branches, to name only a few areas. With solid reserves to protect against unforeseen needs and with strong investment earnings, ASCE has been able to maintain its financial position despite the still lackluster economy. ASCE also benefits from the generous support of the ASCE Foundation, which contributed over $1 million in 2013 and committed $1.35 million for 2014 to support Society programs. Among other highlights of the meeting, the board voted to approve expenditures from the Society’s reserves to support the National Governors Association’s new Governors’ Transportation Coalition. The coalition is designed to be a platform for state governors from around the country to actively lobby the U.S. Congress to continue to fund the Highway Trust Fund. According to the U.S. Central Budget Office, the Highway Trust Fund is experiencing a 10-year shortfall and, if not provided additional funds by Congress, is due to go bankrupt by 2015. The board also heard from Fredric S. Berger, P.E., F.ASCE, chair of the Task Committee on Global Strategy, who provided an update on the adoption of an overall strategy to guide the total spectrum of the Society’s international activities. “About 12 to 13 percent of ASCE membership is international and that number is continuing to grow,” DiLoreto says. “And the question that the board is looking at is: What should our global strategy be? ASCE should develop a global image and become a truly global voice in the civil engineering profession. ASCE should expand its global footprint to allow for more effective delivery of value to members and the civil engineering community worldwide. ASCE should be viewed as an essential leadership participant in global forums where the civil engineering perspective needs to be heard. ASCE should expand the global sale of products and services to better disseminate the civil engineering body of knowledge. ASCE should create a sustainable financial model to generate and maintain its global strategy. As part of the global strategy discussion, the board also received an update on the development and implementation of a plan focused on providing educational and other services to civil engineers in India. The board previously approved the first phase of the project, which includes a presidential visit to India by DiLoreto and ASCE Executive Director Patrick J. Natale, P.E., CAE, F.ASCE, in August for the purpose of conducting a needs analysis of the Indian civil engineering profession. DiLoreto and Natale will meet with selective government entities, Indian civil engineering firms, and U.S.-based subsidiary civil engineering firms operating in India. As part of its ongoing policy review process, the board revised or rescinded a total of 47 policy statements. The board also adopted a new policy paper from ASCE’s Transportation Policy Committee, entitled “Authorization of the Nation’s Surface Transportation Program – A Blueprint for Success.” The paper will serve as a cornerstone of ASCE’s advocacy effort in the upcoming Congressional reauthorization of Moving Ahead for Progress in the 21st Century (MAP-21), the $105 billion surface transportation bill for fiscal years 2013 and 2014, signed into law by President Obama on July 6, 2012. “This new paper pulls together all of ASCE policies that are relevant to the upcoming Congressional debate on the reauthorization of the nation’s surface transportation program,” says DiLoreto. 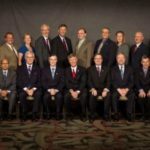 As a member society of ABET, the board voted to approve the Construction Management Association of America as a new member society of ABET and a lead society in the area of construction management. The board also approved changes to the ABET Constitution to comply with current laws in New York State, where the organization is incorporated. The board voted not to ratify a proposed change in the ABET Constitution that would allow international organizations to join ABET as member societies. The board hopes to revisit that issue at a later date once additional work has been completed. DiLoreto says that one of the keys to the success of this board meeting was working under the new committee reorganization, which created 5 Society Standing Committees – on Advancing the Profession, Education, Member Communities, Public Policy, and Technical Advancement – that report directly to the board. “Overall we had a very good and productive meeting,” concluded DiLoreto.